HemaTox™ kits have been developed for testing the effects of drugs on the growth and lineage-specific differentiation of human hematopoietic stem and progenitor cells (HSPCs). Each kit tests for the effect of drugs on the outgrowth of specific progenitor cell lineages, from CD34+ cells isolated from cord blood (CB) or bone marrow (BM). The HemaTox™ Erythroid Kit, HemaTox™ Myeloid Kit and HemaTox™ Megakaryocyte Kit are designed to test erythroid, myeloid and megakaryocyte-specific toxicity, respectively. VALIDATED. Tested in comparison to the appropriate CFU assay in IC50 determination, the current standard for in vitro IC50 determination. REPRODUCIBLE. Optimized serum-free medium and supplement provide robust expansion, allowing consistent results. FLEXIBLE. Test compounds may be added at the start of culture to examine effects on progenitors before differentiation or later during culture to study effects on more differentiated cells. Different readout methods may be used, e.g., flow cytometry. *The cell isolation step may be omitted if pre-enriched CD34+ cells are used. 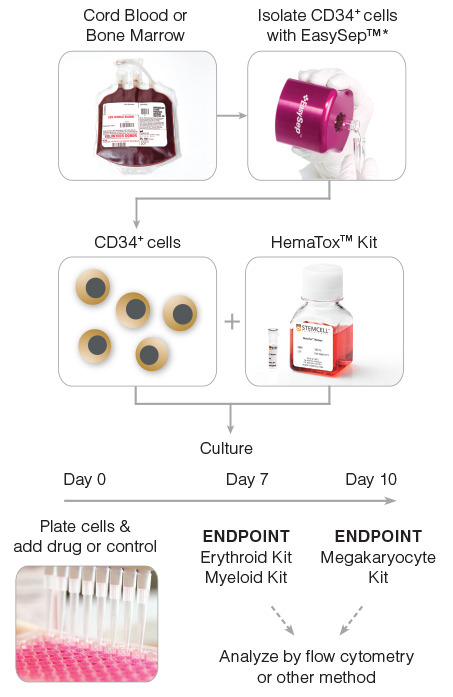 (A) Human CB CD34+ cells were cultured with (B) HemaTox™ Erythroid, (C) Myeloid and (D) Megakaryocyte Kits using the protocol above. After the appropriate culture period, cells were harvested and stained for cell surface proteins expressed on erythroid (CD71 and GlyA), myeloid (CD13 and CD15) or megakaryocytic (CD45 and CD41) cells, respectively. 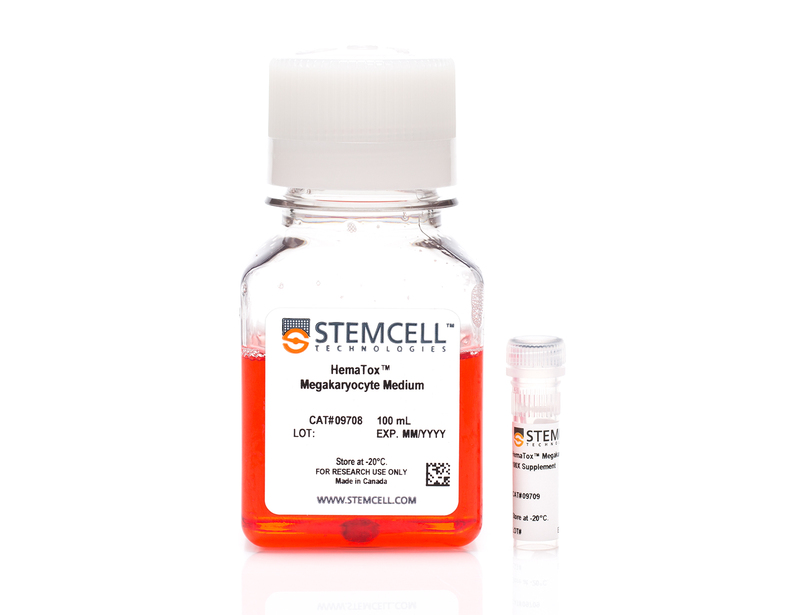 Human BM CD34+ cells were cultured in colony-forming unit - granulocyte/macrophage (CFU-GM) assays with MethoCult™ medium and in liquid culture with the HemaTox™ Myeloid Kit. IC50 values generated using each assay were plotted on the X and Y axes and shown to be highly correlated with a correlation coefficient (R2) of 0.91. 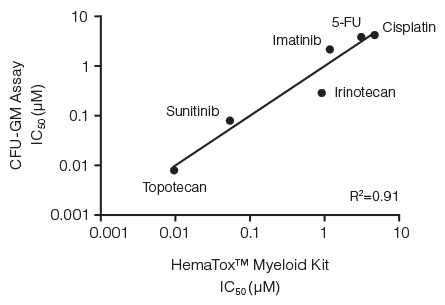 Results show average IC50 values for each drug tested on human BM CD34+ cells using the HemaTox™ Erythroid (grey), Myeloid (gold) and Megakaryocyte (orange) Kits. 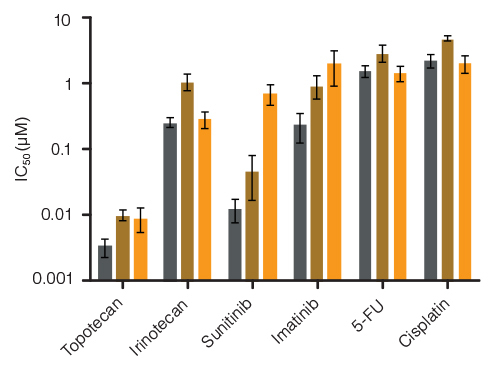 Most drugs show similar toxicity for each lineage but some, such as Sunitinib, are ~100-fold more toxic for erythroid than for megakaryocyte progenitor differentiation with intermediate toxicity for myeloid progenitor differentiation. Vertical lines indicate standard error of the mean (SEM) (n = 4 - 8).